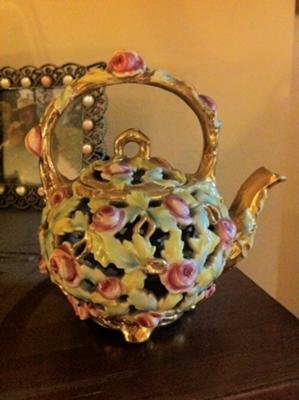 We found this Zsolnay reticulated teapot at a home that was downsizing. The owners had a large dumpster in the front of the house and had placed a number of ojbects in the bin. We asked if we could look in the bin and they said that we could and anything we wanted we could take. We found a number of books and art pieces. The owner was leaving the home in the next day and since they couldn’t get a charity to come and pick things up they had to put them in the dumpster. We showed them this little Zsolnay teapot and told them we thought it was worth something, and they said take it. This little Zsolnay reticulated teapot is very pretty and in very good condition. I cannot find any chips and there is some crazing on the base. There is the Zsolnay mark in black or dark blue, plus the words, in English, Made in Austria-Hungary. There is a number on one of the feet that I cannot read and a number 18 written by hand in gold. We have searched and have found no reticulated teapots made by Zsolnay, but we have found vases that look similar to this design and coloring. 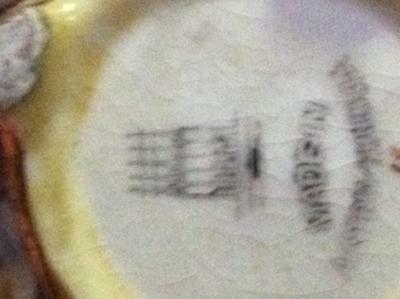 Please help us identify the year and value of this item. I was able to determine that there is an imprint of 3540. I have not seen any item like this on the internet and wanted to determine how rare this item is and what it is worth. Reviewing drawrm.com/zsolnaymarks, it shows that the mark probably dates from 1889-1891.